Visitors will experience a variety of programs in honor of African American History Month. Explore the Museum’s The Story of We the People exhibit to discover key milestones in African-American history. The interactive Breaking Barriers show examines the lives of Thurgood Marshall, Bessie Coleman, Jackie Robinson, and other groundbreaking African-Americans throughout American history—providing insight into the struggles they faced and the rights they secured for all citizens. Their inspiring stories reveal how one individual’s civic actions can impact a nation. Take a closer look at the museum’s rare printing of the Emancipation Proclamation to learn more about its history, the history of the Civil War, and the background of the 13th, 14th, and 15th Amendments. As part of our interactive daily programming in February, test your knowledge of African-American history at our Giant Game Board. 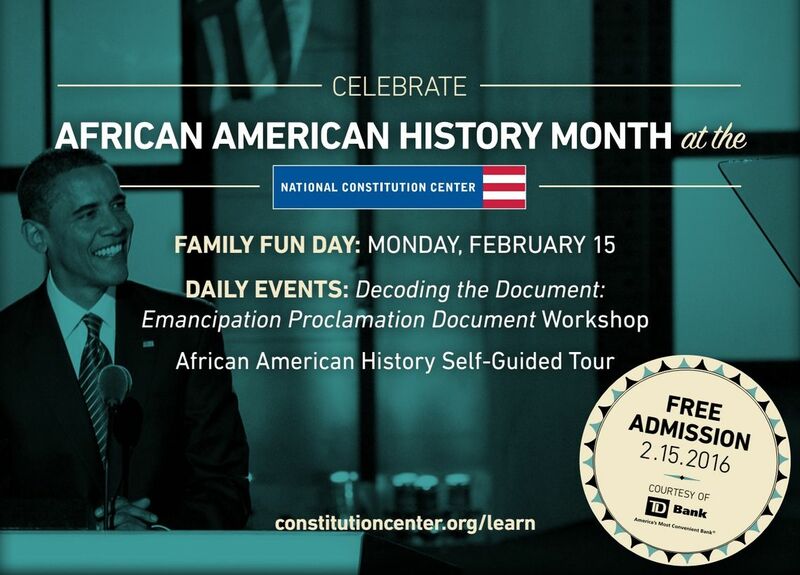 African American History Month at the National Constitution Center is sponsored by TD Bank.